Cynthia Sass, MPH, MA, RD, CSSD is the author of “Slim Down Now: Shed Pounds and Inches with Pulses - The New superfood.” She specializes in high performance nutrition and optimal wellness. Cleaning out your home or car feels so good, like a fresh start, with a sparkly new outlook. 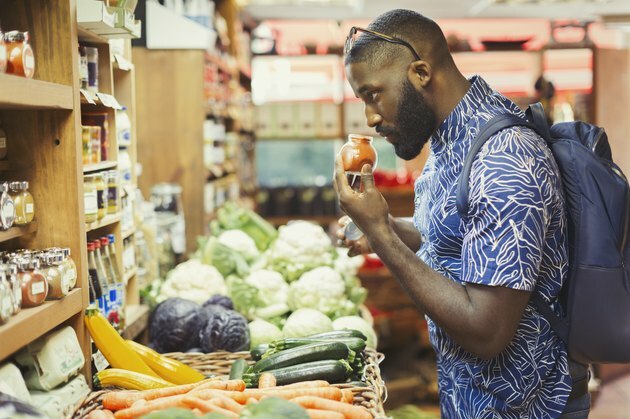 Cleaning up your diet can be even more impactful, with benefits that include all-day energy, improved mood and happiness, better sleep, clearer skin, enhanced digestive health and even weight loss. That’s a lot of bang for your buck, and it doesn’t require giving up delicious, satisfying foods like avocado, almond butter, maple syrup or even dark chocolate. That's why we created the LIVESTRONG.COM Clean Eating Challenge — starting Monday, February 4, 2019 — to help you get going. Clean eating is not at all about deprivation. It’s about eating foods as close to their natural state as possible and paying close attention to how food is made. It involves focusing on food quality and the way your diet impacts your overall health, as well as the health of the planet. 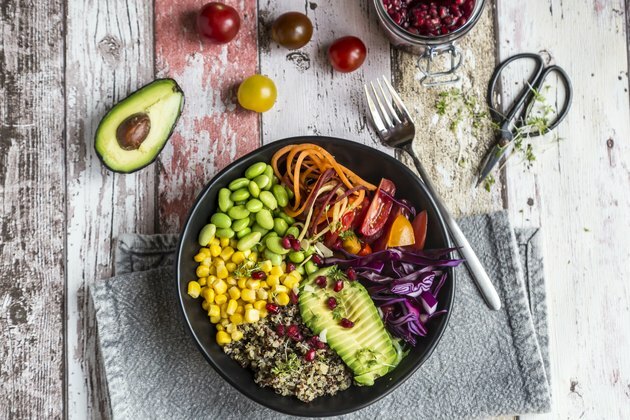 Clean eating isn’t a fad, or trend — it’s a movement, and an important one. 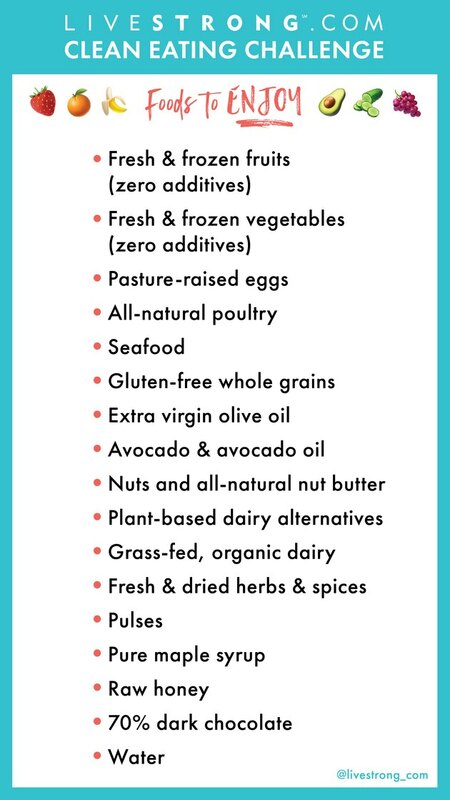 By cleaning up your diet, you eliminate unwanted additives that can wreak havoc on your immune system and contribute to symptoms like fatigue, brain fog, food cravings and inflammation. A cleaner diet also ups your overall nutrient intake and can help boost satiety. And bonus: It’s better for Mother Nature. The best part is, it’s easy! There's a huge variety of food you can eat and simple ways to combine them to create meals and snacks that'll leave you feeling simultaneously full, satisfied and energized. Just follow our handy guidelines and sample menu. Mix and match from the below list of "foods to enjoy" to whip up refreshing smoothies, filling grain bowls, hearty stir frys and even decadent desserts! So what can you eat and what's off-limits? (No processed carbs or refined sugar for starters.) We created two handy, printable guides for you to reference throughout the month (see below). While the lists aren't comprehensive, they should give you a good starting point. Now that you have all your healthy ingredients, what are you going to do with them? 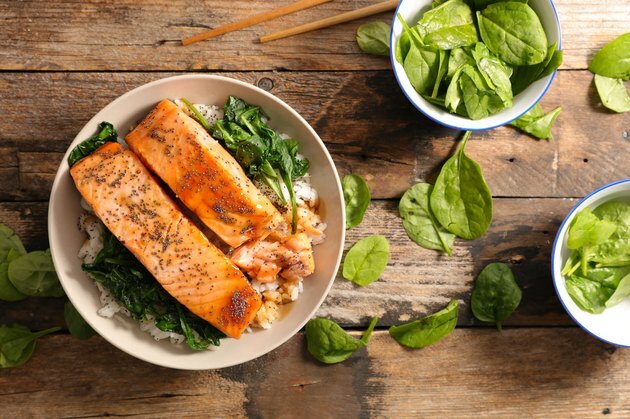 Here are a few meal ideas to get you started. To make things as simple as possible for you, we've created two lists. One is list of foods to enjoy that you can take with you to the grocery store to help you pick out healthy ingredients for the week to come. 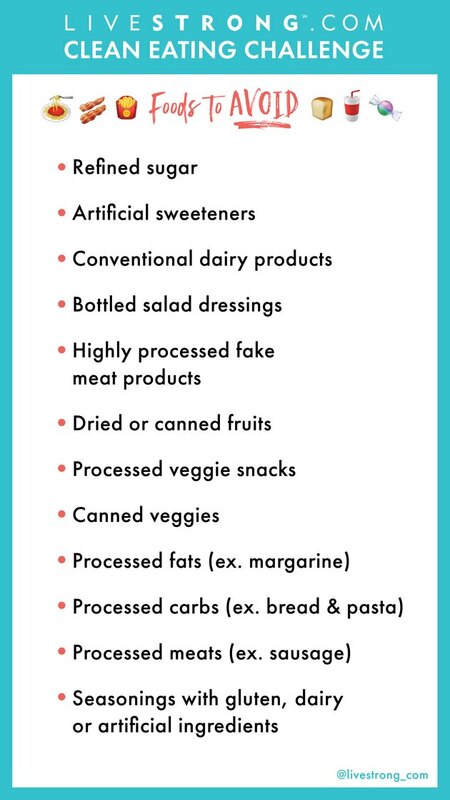 The other is a reminder list of foods to avoid. You can hang this on your fridge or pantry to remind you to stay on track. You don't have to go it alone! We have a community of more than 30,000 members who can help support and encourage you throughout the month (and beyond). So join the LIVESTRONG.COM Challenge Facebook Group for tips, motivation and answers to your questions. Plus, exclusive content you'll only find in the group. So stay tuned! Each day starting on Monday, February 4, 2019, stick as closely as you can to the DOs and DON'Ts of the challenge. If you're new to the concept of clean eating, maybe you want to start with small changes like cutting out sodas or junk food. And make sure you post your progress, small victories, minor setbacks and any questions you have along the way in our Facebook group.